Written by an industry expert, this title fulfills the 45-hour Florida sales associate state requirement. Updated to meet changing market needs, as well as changes in Florida law, this edition offers expanded discussion on financing, with examples using the Loan Estimate and Closing Disclosure forms, which have replaced the Good Faith Estimate (GFE) and Settlement Statement (HUD-1) forms. In addition, fair housing laws and social media are discussed. 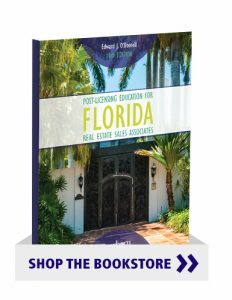 This edition provides a step-by-step guide to conducting business in the real estate industry for new Florida licensees. Special learning features include action lists, useful online resources, case studies, a comprehensive appendix of useful forms, and tips for prospecting all the way through conducting a close. A complete set of Instructor Resources is available for classroom use.